Here is Vasanti Cosmetics Moisturizing Tinted Lip Balm and Wonders of the World Under Eye and Blemish Concealer. 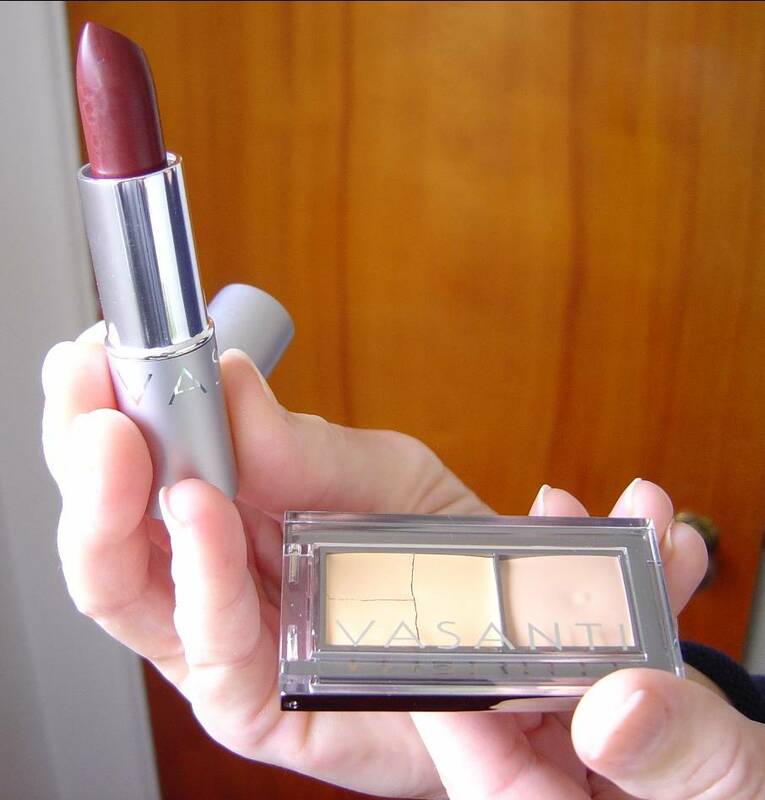 The name Vasanti Cosmetics is new to me. However, I was sent a few of their makeup products to review and must say that I was, indeed, impressed. In fact, I was wondering how they stayed out of my radar for this long. I received a tube of the Moisturizing Tinted Lip Balm in Grenada. On their website, the shade looks a bit brighter of a reddish-brown. In reality, the color is a deeper, warm sheer brown that is natural with just a tad of red to provide a lovely compliment to lips. Once applied, their Vasanti Cosmetics tinted lip balm drenched my dry lips with soothing moisture while delivering just enough beautiful color. This is a wonderful dual purpose product instead of buying two separate items like a lip balm and lip color. The second item I tried was their Wonders of the World Under Eye and Blemish Concealer in Fair to Medium. Although I’m not the fairest shade on the spectrum, I’m usually about the second shade of pale beige in any line and found both of the colors that came together in this compact were wearable. This concealer spread easy enough and covered dark circles wonderfully without settling into any tiny eye creases. For a creamy concealer, I was surprised at how well it also handled hiding a tiny mark left from a blemish. Usually, you would need to use a thicker stick concealer to do the job. But I must admit, Wonders of the World Under Eye and Blemish Concealer, was now my new good friend that earned a rightful place in my cosmetics bag. Looking for some awesome new concealer or an amazing tinted lip balm, then you should do yourself a favor and check Vasanti Cosmetics out. I know I want more of their products and will be visiting them in the near future for myself and for my holiday shopping list. How about you? Previous Post Easiest Custard Pie That Makes its Own Crust! Next Post Are You Confused About Which is Better When Injured Heat or Ice?